Last night I ventured out just as it started to pour with rain. I quite like rain. And I’m rarely without an umbrella. My umbrellas are always bright and cheerful. I’ve had yellow, green, blue. My current umbrella is pink with polka dots. This choice of gaudy umbrellas is completely deliberate. There’s a picture of me as a small child standing at the bottom of the front steps of our house in Goulburn, peering out from under an umbrella. The expression on my face is one of happy fascination. On a good day, that’s still how I feel about rain. Choosing a brightly coloured umbrella is my way of reminding myself that it’s possible to forget about the inconvenience of rain, to forget to worry about whether I’m getting wet. It reminds me that I’ve inherited my Dad’s fascination with weather, and brings out that part of me that wants to jump in the puddles rather than carefully step around them. Because let’s face it: I’m probably going to end up with sodden feet anyway. 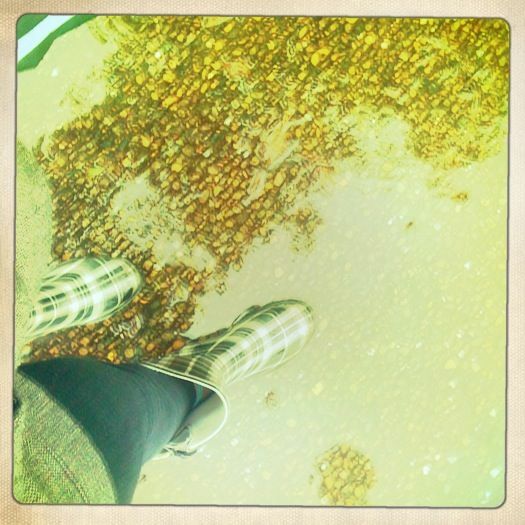 Thinking about the toes of my boots, which are still damp from last night’s rain adventure (no puddle-jumping, but I did give up on trying to avoid the puddles), I remembered that I once posted a little piece here about rain and umbrellas and ruined shoes. ‘Nevermind,’ she said quietly to herself as her suede shoes were rapidly ruined by the rain. At least they had character now. She stood under her broken umbrella on the unfamiliar street corner and marvelled at the genius of the contraption she held above her head. Somehow the rain never made her sad anymore. It reminded her of a place she missed dearly but was also glad to be away from. It reminded her of him, of that street, of that house and of the wet-cold winters. And it always brought a smile to her face, even if her shoes had become its victim. Finding this piece immediately reminded me of all the other times I’ve been stuck in the rain — sometimes with an umbrella, sometimes without — and how each of those moments still sits in my mind, linked in no other way except by the phenomenon of water falling from the sky. It also reminded me of just how many pairs of shoes I’ve lost, standing out in the rain, and how it’s not that ruination that I remember first, but the freedom that comes from realising each time that I can’t do anything about it. This entry was posted in Jottings, Outings, Uncategorized, writing and tagged colours, puddles, rain, shoes, umbrellas, writing by avocadoandlemon. Bookmark the permalink.